Electric, inventive, and mad-cap, this is a family show that has as much narrative style and substance as it does outrageous fun. Continuing on from the success of their production of Alice in Wonderland last year, Iris Theatre returns to Lewis Carroll by adapting his topsy-turvy sequel. Alice catches a glimpse of her older and frailer self through a looking glass. In order to try and make elderly Alice remember who she is, she bangs a little too hard on the mirror and both of their worlds are sucked into each other. In order to save her older self for the notorious Jabberwocky, she must traverse towards rank eight of this giant chess-board world to defeat it. Writer and Artistic Director, Daniel Winder, adapts Carroll’s book with a great deal of intelligence. Most interestingly, he uses a framing device of Alice on the quest to save her older self: something that is not part of the original novel. What this illustrates is that Winder knows Carroll more than most. In execution, it gives the narrative a drive and purpose other than becoming non-sequential nonsense that an adaptation could have easily been. But it also means that, despite being a family friendly show, it gives it real substance that makes it work as equally as fantastic as an adult piece of theatre. This framing device, despite adding to the text, is actually quite organic and relevant. Taking into account darker themes from episodes such as the White Knight’s song and the encounter with the Wasp in a Wig, Winder embraces the fact that there are definite allusions to Carroll lamenting a lost and happy youth: subsequently, a widely accepted interpretation of Carroll’s earlier related work, The Hunting of the Snark. The result is an adaptation that is as engaging as it is electric. The frolics, fun, and nonsense are superb, but empathetically dwelling on the tender melancholy that is inherent in the text gives it that extra edge, making it more than a juvenile affair. The only negative is that it does drag a little in the second act, especially in the more verbose scenes such as that with Humpty Dumpty. This is mainly because of the original book itself is lengthy, but also because Winder et al had set a pace in Act I that was always going to be difficult to keep up with. But given everything else that’s amazing about this production, it really is a trivial criticism. Although not a musical per se, there are plenty of songs throughout. Candida Caldicot creates a score that captures the anarchy and wonder of Carroll’s world. With this, the songs themselves are fun, simple, and catchy, making them especially suitable for children but immensely enjoyable for adults. Caldicot can also pen a ditty that has as much heart and emotion, where needed, to bolster Winder’s emotive vision. She also isn’t afraid to experiment, using vocal and musical effects at points to create atmosphere and tension, such as in the Jabberwocky’s lair, to great effect. There is so much I can laud here, I’m not sure where to start! Ultimately, Tara Finney’s large team of set, lighting and sound designers, builders, and movement directors manage to transport you to Wonderland effortlessly. Using only a fairly minimum bits of set and props – such as fairy lights, and various landscaping features – the several performance areas are decked out to create enough whimsy to prompt audience members on their own journey of imagination. But what’s tremendous is tenacity and inventiveness of Finney’s team, finding surprising things to take advantage of that are already existing within St. Paul’s church and its grounds, adding extra and unexpected oomph . One example is using a low chord on the church’s own organ when entering the lair of the Jabberwocky. This could have easily been done using pre-recorded sound on their excellent AV equipment. But by doing this instead, the audience also get to feel the physical rumble of this domineering instrument, making it particularly exciting and scary. But there’s also a very high-end professionalism here too. There are some moments that are as aesthetically arresting as those you’d find on a West End stage. For example, older Alice’s bed chamber is breathtaking when you enter, with it’s larger than life tilted bed engulfed in the vast Edwardian church space. There’s also a wonderful moment the Wasp in a Wig teeters off, holding high the golden comb given to her by Alice, making it glint in the spotlight and casting an imposing shadow as she exits. These touches edmonstrate that this isn’t just a lets-have-a-laugh-and-cobble-together-an-outdoor-promenade-production, but that Iris Theatre to be as professional outfit as anything else in the West End, if not better than some of the productions currently on in the theatres. Director Jamie Jackson also ensures a solid balance in this being a promenade production, making sure the audience are never spending too long or too quick a time in any place. But he also understands how effective interaction can be and is never scared to directly involve the audience. There are plenty of moments when the audience are involved, either as individuals dressing up Tweedle Dum and Tweedle Dee, or merely being squirted by water pistols from afar. He’s also not afraid of being inventive within this family friendly context, accommodating some of Isla Jackson-Ritchie’s bold pieces of physical theatre to great affect. Thus, he’s as integral a contribution to the show as Winder, Caldicot, and Finney, all seeming working as one to pull of this tremendous show. I absolutely can’t bring myself to single out particular cast members here: they’re all as accomplished and as brilliant as each other. This is a cast that not only know how to act, but know how to have outrageous fun. They all throw themselves into their roles with brilliant aplomb, creating exuberant and engrossingly charismatic characters. They portray Carroll’s over-the-top personalities by wallowing in his nonsense as if it were gospel. But this is far from pantomime, and behind these outlandish characterisations there’s are passionate, creative, and mindful interpretations of the characters. Contrariwise, during Winder’s more touching moments, the actors treat their characters with a tact and subtlety as if a soft tragedy. Each player is the life and soul of whatever party they are at, and it’s a joy to see a cast as jubilant and having as much fun as the audience. Wild, riotous, and magical. 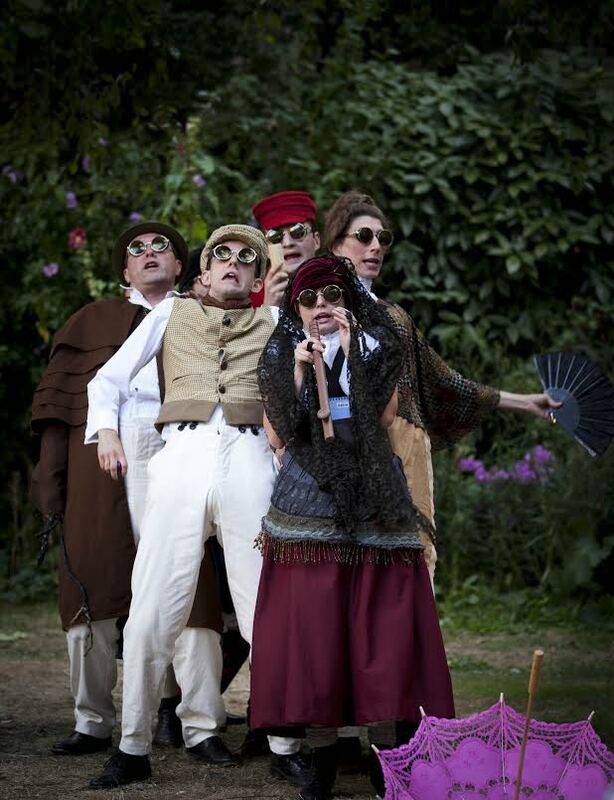 This is one of the best pieces of summer theatre you could ask for. Even though it’s a family friendly production, there’s nothing here that will make adults feel left out or patronised as there’s a real sense of substance and intelligence among the madness and frivolity. It’s a production that makes you want the summer to never end, just so Iris Theatre can keep producing gems like this. An absolute masterpiece. 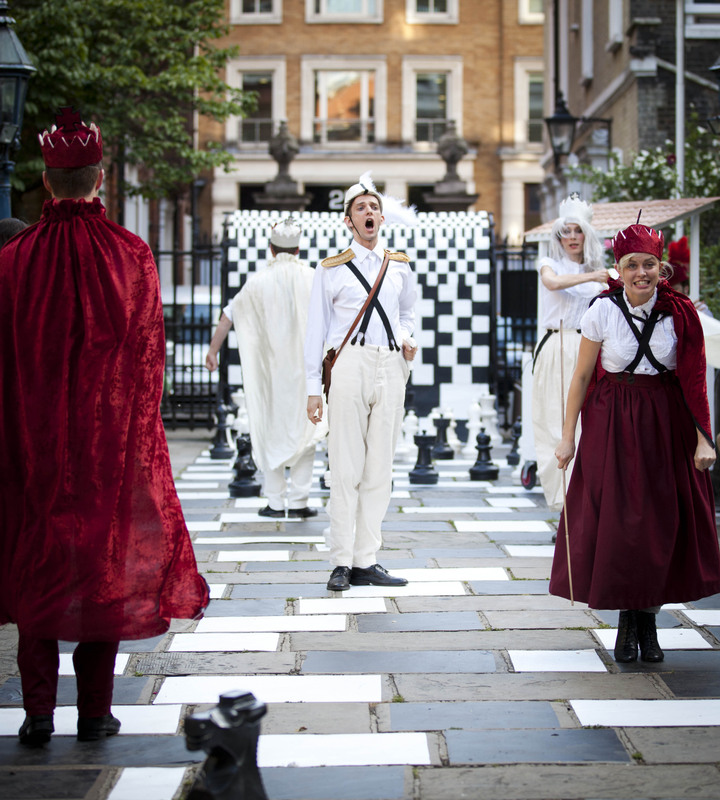 Alice Through The Looking Glass plays at St. Paul’s Church Covent Garden, London, WC2E 9ED, until 30 August 2014. Tickets are £17.99 (concessions available). To book, visit www.iristheatre.com. Celebrated theatre company, Shunt, who are renowned for their large-scale site-specific theatrical experiences, will be blasting the shrink-wrap off a new summer performance venue in North Greenwich, with new show The Boy Who Climbed Out Of His Face. 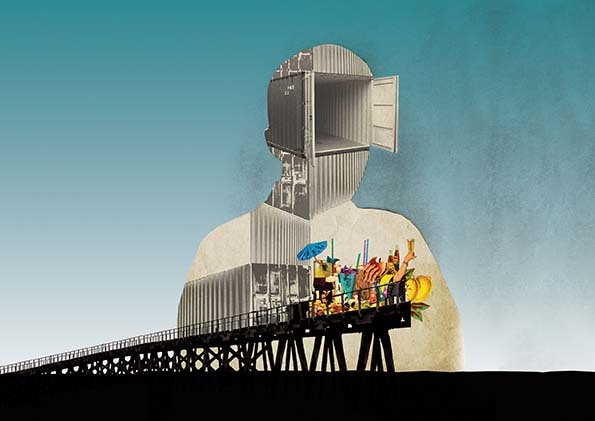 Situated on an old coaling jetty elevated above the river Thames near the O2 Arena, Shunt, in their first ever outdoor production, will usher willing audience members through a disorientating and multi-sensory experience inside a cluster of shipping containers. Their previous fully-immersive theatre pieces, such as The Architects and Money, has won them fame and acclaim time and time again, and The Boy Who Climbed Out Of His Face looks to continue their track record of thrilling and bold events. If you’re not feeling that brave, there will also be a pop-up bar and food venue, so you can keep yourself occupied whilst you assume your friends will join you later for a much needed drink. Tickets are £10, which is incredibly affordable. So given the bargain price and Shunt’s reputation, I would highly suggest booking asap as it’s likely to sell out quickly given the strictly limited six week run.